Garden Hills Park, located in the heart of the neighborhood, includes a playfield, poolhouse, playground, and neighborhood recreation center / clubhouse. The rustic clubhouse, originally built in the 1930’s and boasting a large porch and fireplace, stands almost hidden in a wooded area beside the pool. Known as the Garden Hills Rec Center, it hosts many community activities, and is available for rental for private functions. Sunnybrook Park, a wooded strip with a stream and stone bridges, sits between Brentwood Drive and Brentwood Terrace. A plaque marking the park was installed by the Garden Hills Women's Club in 1934. In 2016, tree identification plaques were installed on 27 different species of trees within Sunnybrook, providing a guide to nature as you stroll its paths. Alexander Park is an undeveloped wooded area, fronting on East Wesley Road across from the swimming pool. A marker recalls the family of Aaron Alexander, whose family owned the tract in the 1870s. The marker was erected in 1942. This park was used for summer camp activity in years past, but is today primarily a natural wooded area replete with a rich offering of urban wildlife. Frankie Allen Park, is another neighborhood park within Garden Hills. It contains baseball diamonds, a playground, tennis courts, walking trails and granite grill/picnic areas. Formerly known as Bagley Park, the park was created after World War II when the African-American community known as Macedonia Park was razed and replaced with public land. A small cemetery, located on the high ground on Pharr Road just east of Lookout is all that remains of that community, which included several dozen homes, stores, and two churches. The development was planned in three phases. The earliest homes were built in the Peachtree Section, which included Rumson Road, Rumson Way and Bolling Road. The Country Club Section, which included the pool and community center, stretched from the pool east on East Wesley, Brentwood and Pinetree to North Hills Drive. The Brentwood Section included all the streets from North Hills Drive to Piedmont Road. Most of the homes in these three sections were built in the late 1920’s and early 1930’s. 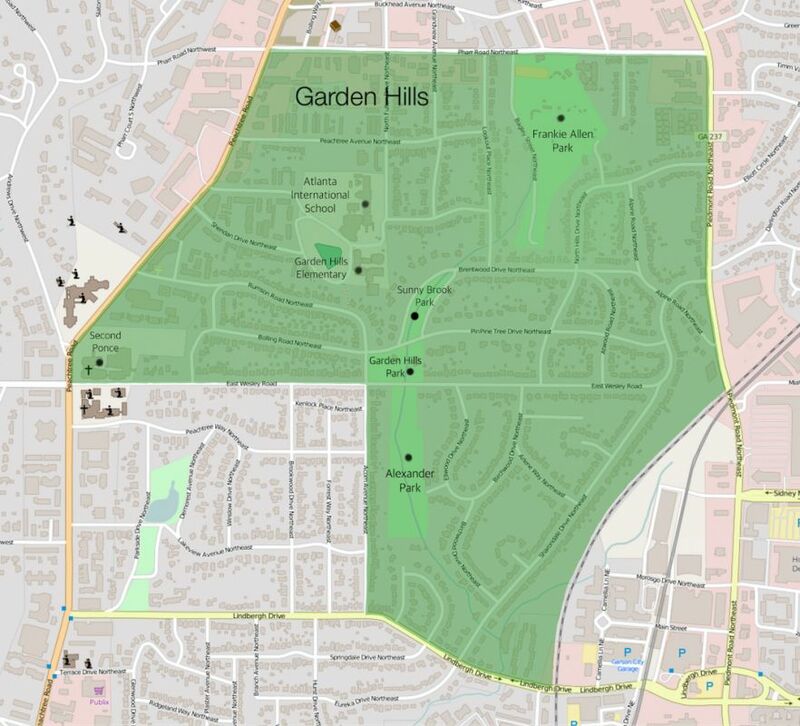 The boundaries of Garden Hills expanded beyond the McDuffie plan over the years to include two other large tracts. In the 1930s Lookout Place was extended south to connect street traffic between Garden Hills and Peachtree View, the first subdivision in Buckhead, featuring homes on Peachtree Avenue, Delmont, Lookout, and Grandview. Subsequently, these homes were incorporated into Garden Hills, and are fondly referred to today as the north forty. After the Second World War, developers added new streets south of East Wesley between Alexander Park and the railroad track. These homes on Birchwood, Elwood, Arlene, Springdale, Parkdale and Sharondale, date from the fifties and sixties. When MARTA proposed taking some of these homes for right-of-way in the 1970s, homeowners banned together to oppose the plan. They prevailed in saving the homes, as the rail line was built on Southern Railroad right-of-way. As a result of that joint effort, these homes became officially part of the Garden Hills community, and are known as the south forty. Today, the Garden Hills neighborhood comprises over 750 single-family homes plus some multi family units on the streets near the commercial and institutional properties. When most of these homes were built, the land was part of unincorporated Fulton County. The buildings housing the Atlanta International School today were built in the early 1930s as North Fulton High School. In those days, our neighborhood was in the unincorporated northern part of the county. 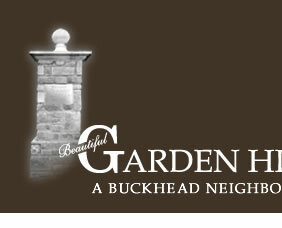 In 1952, Garden Hills was annexed, and has been part of the City of Atlanta since. In addition to the Atlanta International School, we are also home to Garden Hills Elementary School (K-5) – built in the 1940’s – and the K-8 school at Christ the King Cathedral on East Wesley Road. Garden Hills is a great place to live because so many pitch in and work at keeping a vital community spirit alive. Much of the appeal of Garden Hills stems from the way it has adapted with the changing times, while retaining the charm of a bygone age with classic homes, old growth trees and quiet streets, all in close proximity to a bustling urban landscape and the amenities of city life.